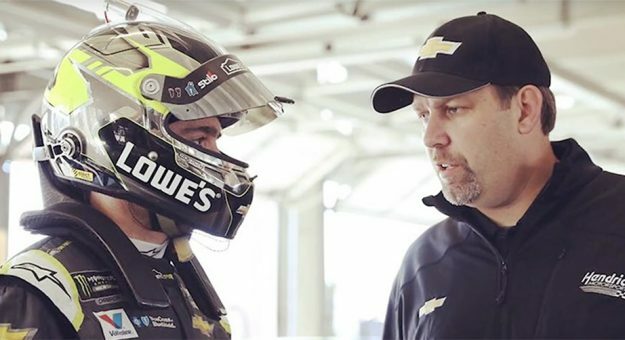 When seven-time champion Jimmie Johnson takes the green flag for the Advance Auto Parts Clash at Daytona International Speedway on Feb. 10, it’ll be his first race with new crew chief Kevin Meendering. After 17 seasons with Chad Knaus on the headset, Johnson will hear Meendering call the shots for the No. 48 Hendrick Motorsports team. While Meendering isn’t a household name like that of Knaus, the road to this once-in-a-lifetime opportunity to lead Johnson to a potential record-breaking eighth Monster Energy NASCAR Cup Series championship was well-earned. RELATED: Who will have the biggest impact — Knaus or Meendering? Meendering worked his way up the ranks at Hendrick Motorsports, fabricating and building suspension parts shortly after graduating from the University of North Carolina at Charlotte, transitioning to a research and development position before joining the No. 24 team of Jeff Gordon in 2008 as an assistant engineer. In 2016, he moved to JR Motorsports to work with Elliott Sadler atop the box. In three seasons with Sadler in the NASCAR Xfinity Series, Meendering led the No. 1 team to three wins, three playoff berths and two Championship 4 appearances (2016-17). The 37-year-old admitted he has some nerves going into his first season with arguably the best driver to ever compete at NASCAR’s highest level. But behind every great driver and crew chief pairing are hundreds of people at the shop who make it all happen behind the scenes. Meendering knows the depth of the organization because he’s been there before. Meendering is also confident of the relationship he and Johnson have been able to develop in such a short period of time, which is another reason why fans of “Seven-time” should have no cause of concern with this fresh start.